The Summer Olympics is well under way in London and the Canon EF 200-400mm f/4L IS + 1.4X is popping up in quite a few events. The photographers using the lens on loan have generally great praises for the new gear. I expect Canon to officially announce the post production version of the new lens by the end of the year. The weight and price should be about the same as the Canon EF 500mm f/4L IS II, perhaps between 7 - 8 lbs and about $11,000. The Brown Bear is perhaps the most archetypal of all bear species and shows incredible geographical diversity, and the single species recognized today was at one point in history divided into 232 living and 39 fossil species and subspecies. 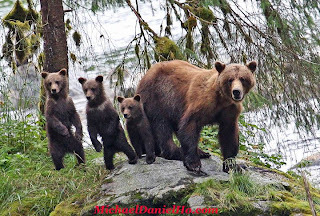 Some of the more well-known subspecies of Brown Bear include the Grizzly Bear, named for its silver tipped fur, and the Kodiak Bear, the largest form of Brown Bear, which can weigh over 1500 pounds, and is found on Kodiak island off southern Alaska. Today, the Brown Bear is most commonly hunted for sport, or poached for the appalling commercial trade in bear paws and gall bladders. Hunting legislation varies between countries, but where permitted, it is controlled through the use of permits and maximum annual quotas. However, due to difficulties with the development of monitoring plans, the sustainability of quotas in some regions is questionable, and there are also significant problems with illegal hunting, such as in the Russian Far East and South East Asia. In the US, the term Brown or Grizzly Bear is generally used interchangeably. Grizzly bears usually pair off with each other after the males have defeated all their challengers. They mate in the summer and hibernate for the winter. Sows (female bears) give birth while they are hibernating and the cubs are about the size of one's big thumb at birth. They generally have about two to three cubs but sometimes four or in rare cases, even five but a big litter usually do not survive the hibernation. The mother and cubs emerge from their den around late spring and they are ravenous and start eating vegetation immediately to clear their digestive system after the long sleep. After that they go find anything edible. That would include Elk calves, squirrels, carrion, etc. Generally, salmons are on the diet for Bears living along the coasts in Alaska. Their emergence from the den coincides with the salmon runs in the summer if their fortunes hold in a good year. I went with a guide who is very experienced in bear watching but a loaded shotgun is required in addition to good photographic equipment because surprising a sow with cubs can be deadly. The mother is very protective of anything or bear she perceives as threatening to her young. The places we visited had good salmon runs and both Black and Grizzly bears were spotted. Many sows have cubs and I saw a litter of three and even a litter of four. Sadly, less then 50% of the cubs survive their first year. They can be killed by male bears, other predators, inclement weather or just poor mothering skills. 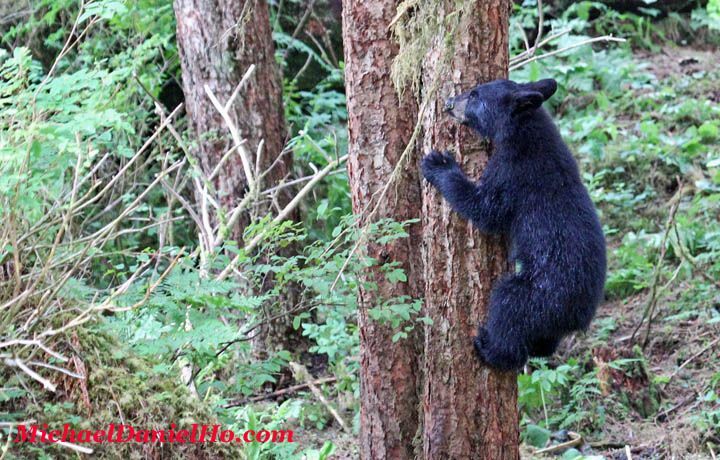 I saw this small Black bear cub wandering around the woods without its mother. The outcome seems inevitable and very sad to me. 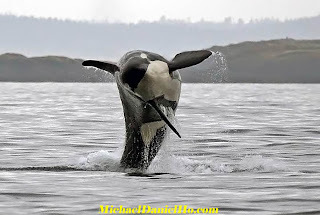 It is proving to be quite tough to find Orcas in the waters off eastern Vancouver Island. 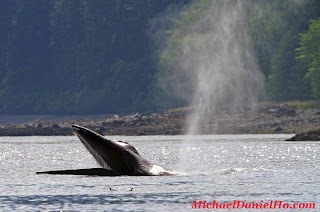 Went up and down Johnstone Strait and the surrounding waters and the sightings were slim. Came across a few unexpected Humpback whales but I already have many photos and encounters with Humpbacks in SE Alaska. I want to concentrate on finding Orcas in the next few days. Athabasca Glacier - Oh Canada! I rented a car in Vancouver and crossed over to Vancouver Island in a ferry. It takes about two hours and those who live in the UK will find this ferry almost identical to the UK cross channel ferries, replete with screaming kids, over priced food and merchandise but the seas is not as rough as the English Channel. Driving up north and looking for Orcas all along the middle to the northern tip of VI. There are at least two resident pods here and the coves and inlets are simply beautiful, minus the snow and floating icebergs of SE Alaska. Canada is slightly larger than the US in land area but with about 1/10 the population. One can be forgiven for thinking one never left the United States when visiting this lovely country. To begin with, the people are friendly and the language and accent is almost 99% the same, the Canadian and US Dollar is trading almost at parity. The road system, highway signs, cars and trucks and many stores and fast food outlets are very similar, if not identical. But that's the surface, dig a little bit deeper and one will find clear distinctions between the two countries. Canada has two official languages (English and French) and uses the original English form of spelling. They use the Metric system while the US has one official language and still retains the Imperial system, the only industrailzed country to do so. Canadian road signs are in kilometers, gas is priced in liters, food is sold in grams and kilograms, temperatures are reported in celcius, etc. The Canadian government is a parlimentary democracy while the US has a Congress and Presidency, both distinct branches of government. 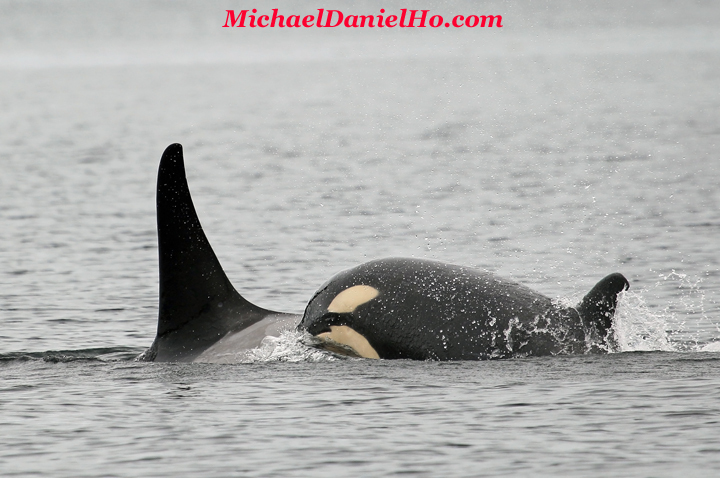 The next week will be spent looking for Orcas and getting to know the Apex Predator a bit better. Still have not gotten around to looking at all my Grizzly Bear photos. I will post a cute one soon but there are many to choose from. It's a tough job trying to decide which photo is cuter. Love them all. Bears are very near and dear to my heart, like Whales and Big Cats. 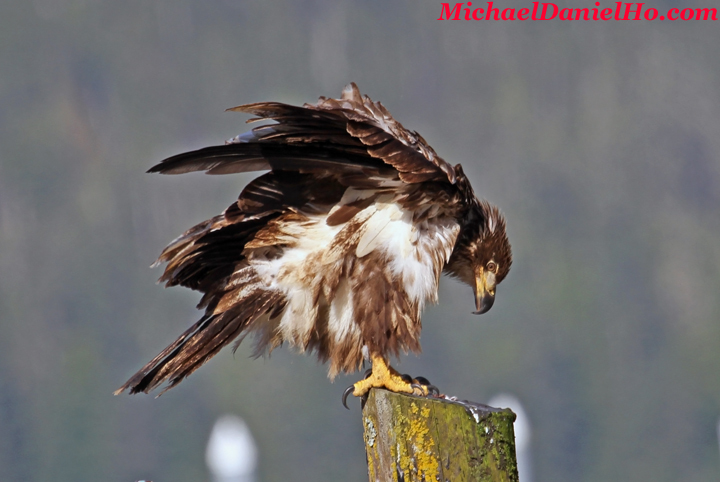 The thing about wildlife photography in Alaska is everyday there is something new and different. One can never predict the weather or the sightings. I have been here many times and each trip is unique in its own way. We went out again a couple of days ago to Frederick Sound in the small boat as usual. The weather started out with the customary very low clouds and gray sky but the air is sparkling clean and fresh. The seas can be rough at times but also peaceful and calm, depending on where one is in the Sound. The search went on for hours, occasionally one or two Humpbacks will appear but they are too busy feeding or resting so we left them alone. Finally we came across a pod of about twelve Humpbacks scattered around a small area. They were feeding voraciously and the hope of Bubble Net Feeding came to my mind. But one look at the depth finder indicates the food is about 100 feet below and they don't look like small fishes, but mostly krill and plankton. Another confirmation of that is there are no birds and gulls circling around the surface. My hopes being dashed for photographing BNF, I settled down to wait for the whales to surface. They came up for air and immediately went back down. Our boat is now in the middle of the Sound surrounded by a few islands. The water is calm and glass like, the weather has improved a bit. There is not a single boat in sight for miles. We are the only thing on the water as far as the eye can see and there is a sacred silence in the air. I closed my eyes to meditate for a few minutes. It was refreshing and for a moment I can forget where I am. The tranquility was unexpectedly shattered by loud trumpet sounds from the Humpbacks' blow. It was music to my ears. At least six whales came up close to the boat, their blows were brassy and shrill, the loud sound bounced against the boat and the surrounding mountains and the echoes came roaring back. It was exhilarating and surreal to hear these stereophonic, even quadraphonic Humpback sounds. More whales began to surface and they seem to decide to take a rest all at once. They stayed on the surface, blowing and turning. "Double breach!" yelled the captain behind my back, suddenly. I quickly turned and fired away. There was no time to think or react, I just fired off a burst of shots in the direction of the breach. All I saw was a split second of two big, black blurry objects shooting out of the water followed by an immense splash circle of water. Fortunately from experience, I always have my camera on an aperture and shutter speed setting to anticipate quick action and burst of shots. Humpbacks do not generally breach during the feeding season. Seeing a breaching whale closeup in the Sound is a real treat. 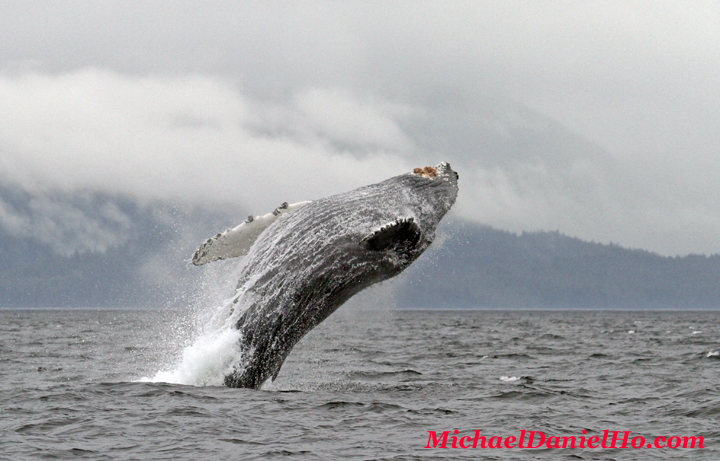 Photographing a breaching whale is a real privilege. Documenting a double breach is over the moon for me. Also did some landscape shots but once again, my photo of Shakes Lake does not do justice to its natural beauty. The boat was moving and I did not have a tripod and polarizer filter. This is primarily a wildlife trip for me. On my way to Vancouver Island, Canada. As the Photokina Show in Cologne, Germany is approaching, more rumors have appeared that Canon will announce the replacement of the venerable EF 100-400mm f/4.5-5.6L IS lens soon. 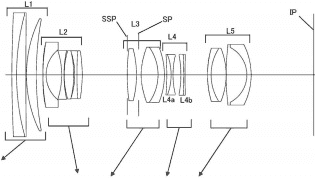 As reported earlier on my Blog, the new Series II lens appears to have a slightly faster aperture, f/4 at the wide end and will feature a zoom ring, like the EF 70-200mm f/2.8L IS II. The price will be about $3,000. An entry level, full frame DSLR camera will also be introduced with about a 20 MP sensor, AF points similar to the EOS 7D and powered by the Digic 5 processor. It will be priced aggressively, perhaps about $2,000. 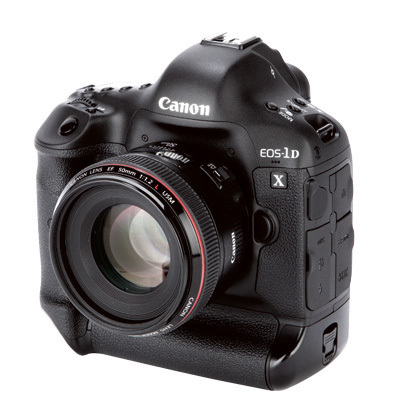 The price of the EOS 5D MK III has also been lowered. One can find deals for about $3,300 now. 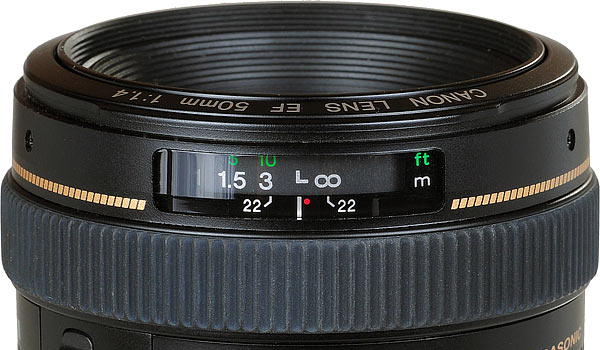 Savings are even more when combined with the EF 24-105mm f/4 L lens. I am still on my Alaskan photo shoot. Don't have much time to post but I can tell you I can't wait for the EF 100-400mm L Series II lens to come out. I use the current 100-400mm extensively on my shoots and I love the performance and versatility of this lens. South East Alaska is an archipelago, comprising of thousands of small islands. The higher mountains around these islands are snow capped year round and the others are partially covered in snow most of the time. The verdant small islands juxtaposed against the snow capped peaks are simply breathtakingly beautiful. It is hard to take good landscape photos while bouncing around on a small boat so this photo does not do justice to the wonderful scenery, especially on a nice sunny day. 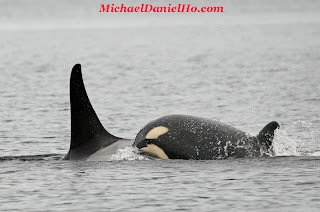 We went out looking for Orcas after hearing from the other boat captains they are around the Sound. Looking for whales is hard work and comes down to a lot of waiting and vigilance. Orcas usually travel in a pod of around one or two dozen animals. There are resident and transient pods. The resident pods generally reside within a large territory of water but they remain there over time and feed mostly on fish. Transient Orcas roam the seas and oceans with no particular pattern and they hunt anything they can kill, including seals, sealions, dolphins and other whales. After a long search, we came across one lone male Orca. His huge, six foot dorsal fin filled my binoculars when I spotted him in a distance. When we got closer, a couple of females appeared but they were rather scattered. 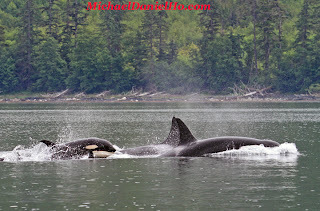 Followed them for a while and they led us closer to the shoreline and more and more Orcas appeared, including calves. They were traveling quite fast, clocking over 10 knots per hour at times. Followed the pod for about an hour and broke off to find Humpbacks. After about an hour, we came across another pod of Orcas coming the other direction. This pod also has calves and they stick right up against their moms. Every time the mother Orca surfaces or dives, the calf follows in unison. It was just wonderful watching the entire pod on the move and interacting with one another. After an hour of this action, I was quite exhausted. Will be looking for more Humpbacks tomorrow. 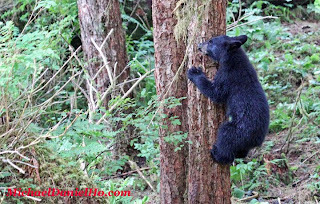 SE Alaska and the Tongass National Forest in particular, is a temperate rain forest. In fact, it is the second largest rain forest after the Amazon. Not surprisingly, it rains a lot. The vegetation is lush and verdant, the air is clean and covered with low hanging clouds and mist. On a beautiful day, the scenery is simply spectacular. 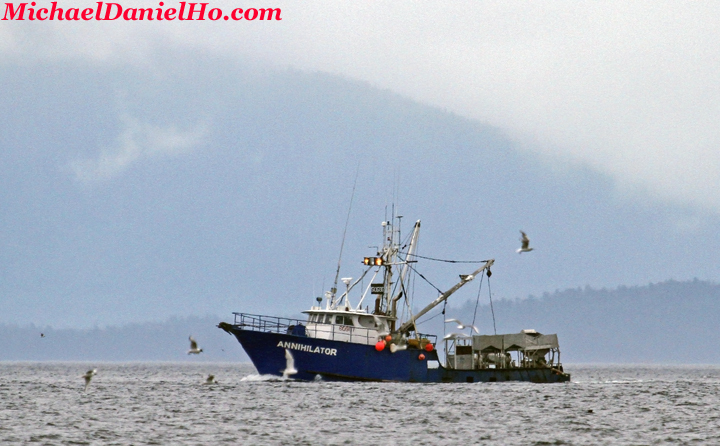 On the seas, one would find the solitary fishing boats, out on a few days to catch halibut, salmon, crab and other seafood to bring back for immediate processing, then cold storage and shipment to worldwide locations. 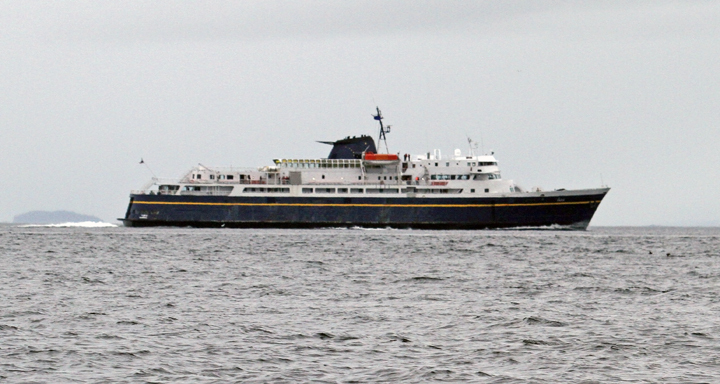 State ferries from the Alaska Marine Highway System can be seen plying the waters bringing needed supplies and passengers along the entire coast of Alaska. 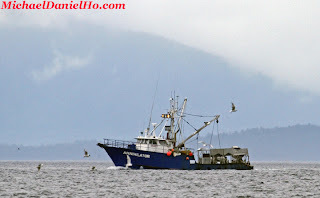 I have been going out on a small boat everyday in Frederick Sound trying to find wildlife. Most days are dreary with light rain, very low clouds and sometimes accompanied by thick fog. Finding wildlife is challenging in these conditions. The Humpbacks feed all through the day until darkness but finding them is not as easy as advertised. They will submerge themselves often to feed on the food found 100 feet or more below the surface and occasionally surfacing to breathe. This makes getting a good action photograph of them very tough. Unlike during the winter in Maui, where most these whales return to mate and give birth. There the whales do not feed at all and they spend more time on the surface so there are more opportunities to get good action shots. 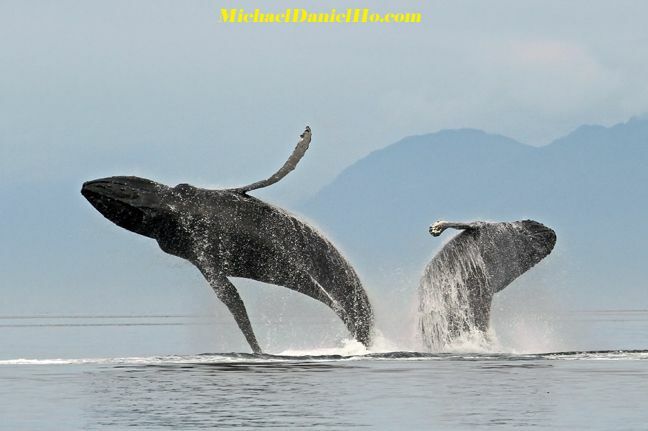 Since most whales are ravenous, there is little time for frolicking. The majority of their time is spent on feeding and resting. I came across a mother and calf pair resting just below the surface of the water. They were so quite it took me a while to realize they were there. Most of the time, the whales are quite far and I have to use the Canon EOS-7D camera to get the additional focal length. I am also trying to test my new Canon EOS-1D X camera but most of the action is so far away right now, the opportunity to use the new equipment is limited. 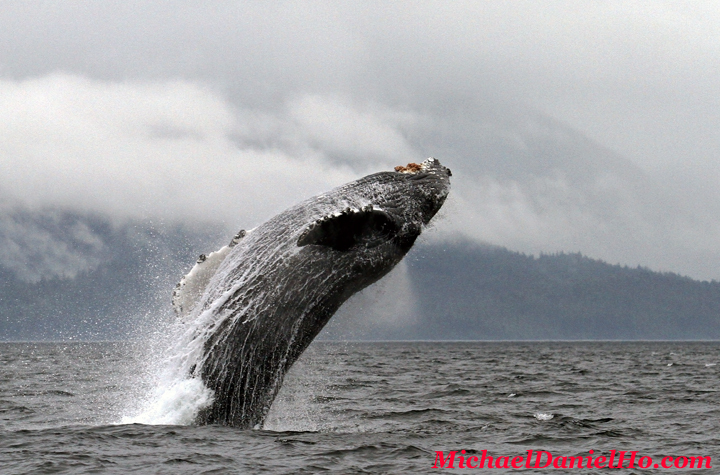 Catching the breaching Humpback in Frederick Sound is very satisfying for me. It is not often one sees this kind of behavior during the summer feeding season and the angle is also quite good. Hope to get more shots like this before I leave. Heard from other boats captains that they have sighted Orcas in the area recently. This is very welcome news and if I can find them, it will be a great treat because Killer Whales are not found here in these waters regularly. More waiting and searching for the next few days. Stay tuned. I am still on my Alaskan Photo Safari. Weather is OK, light rain most of the time but it gets very foggy and cloudy at times and it makes finding whales and other wildlife difficult. Will be posting more updates later. The state of Alaska has less than 700,000 people, about 1 person per square mile. SE Alaska has many small islands. I am on the island of Mitkoff right now. The only access to these islands and most places in SE Alaska is by boat or plane. The lifeline to this area is the Alaska Marine Highway system, limited commercial flights provided by Alaskan Airlines and an army of bush pilots. 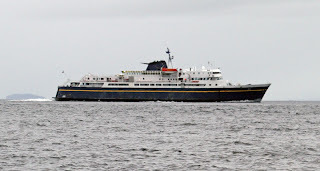 The AMH is a ferry service operated by the State of Alaska to carry freight and people. It runs from SE Alaska all the way through the Aleutian Islands, a distance of over 3,000 miles. On can stay on the ferry and do the whole journey for a couple of months, stopping along the way in all these interesting towns and wildlife spots. The plane I flew in to get here is specially designed for freight and people. The front half of the plane is devoted entirely to carrying freight and the back half for passengers. Most people in Alaska are friendly and rugged individuals but you find a lot of them are transplants from other states, attracted by the great outdoors and the adventures and beauty the state offers. At this time of the year, one can expect about 18 hours of daylight and there is so much to experience and explore here it keeps me coming back over and over again. Went out on a small boat to Frederick Sound to find Humpback whales yesterday. Weather was OK but the whales were too busy eating and their food is concentrated between 100 to 200 feet below the surface so they were diving frequently to feed. I did not get a decent action shot after a long, hard day on the boat. Will be out again everyday until I leave Petersburg. 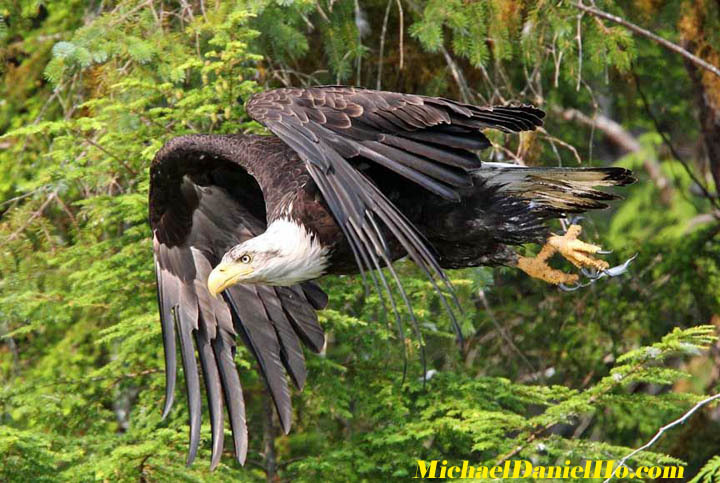 By the way, when I was taking the photo of the Bald Eagle, an older couple approached me and started chatting. He was born in Alaska (in fact the town that I will be going to next) and lived in California (the city I am living in now). What kind of coincidence it that? In this whole wide world, we would bump into each other like that. 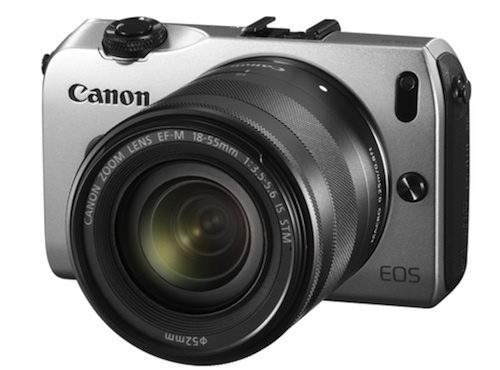 This is apparently what the new Canon Mirrorless Camera looks like. 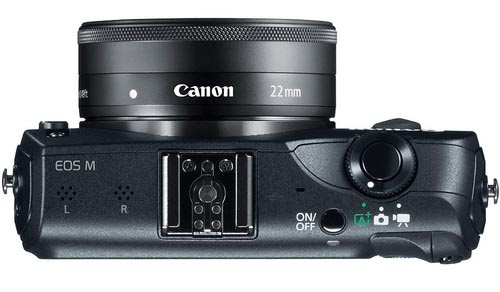 It will have a 22mm f/2 STM lens with the EF-M mount and will not have too many bells and whistles. The strategy at first seems to be aiming for the point-and-shoot segment of the market. Not much is known right now. I am on a photo shoot in Alaska and will not be able to post as regularly as I want. Please keep up with me and I will be posting whenever I can find time and WiFi signal. With the Olympics just around the corner, my sports photographer friend from England, who is covering the Games, informed me he heard there are a few EF 200-400mm f/4L IS + 1.4X extender lenses floating around the armies of photographers and he will try and locate one and get a first hand look at the equipment. I expect the EF 200-400mm lens to be officially announced some time after the Summer Olympics. Also as part of the new lens announcement that may accompany the new, entry level DSLR mentioned in my last post, it may include the long awaited upgrade to the EF 50mm f/1.4 lens. 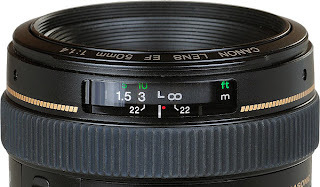 The Series II lens will be more in line with the recently released EF 24mm f/2.8 IS and EF 28mm f/2.8 IS lenses with similar technology but without the IS. It should be priced about the same as well, around $800. It is impossible to be precise with these predictions but the EF 50mm f/1.4 lens is in line for an upgrade. The lens is a very good performer and great value in the EF lens lineup. Remember a few posts ago, I mentioned there will be a few more new cameras from Canon before the year is up? It appears they may introduce an entry level, full frame DSLR to round out their entire line soon. The announcement of the camera may be accompanied by a few non "L" lenses and its price will be aggressive, perhaps just below $2,000. 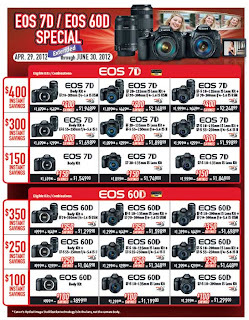 This may be Canon's strategy of reigniting the full frame DSLR 'craze' by stimulating another wave of demand for full frame cameras much like they did in 2005 when they first introduced the EOS-5D line. At the time, the only full frame camera in their lineup was the professional grade, EOS-1Ds MK II and the price was very high. The Canon EOS-1D X is a remarkable camera but it does have some annoying features that Canon should look at and try and correct with the next Firmware update, in my opinion. First, it does not AF with apertures smaller than f/5.6. This is particularly annoying to me because I usually travel light when on photo shoots and rarely bring big tripods or faster and longer, 'Big White' lens like the EF 400mm f/2.8L IS and 500mm f/4L IS. Being a full framed camera and adding the Canon 1.4X III extender only provides me with a focal length of 560mm when I shoot birds handheld with my EF 400mm f/4L DO lens. As any bird photographer will tell you, one can never get enough focal length. That's why I always bring the Canon EOS-1D MK IV with me as well because it can AF down to f/8. The second annoyance is less of a problem but still needs fixing. The AF points on the EOS-1D X is black. 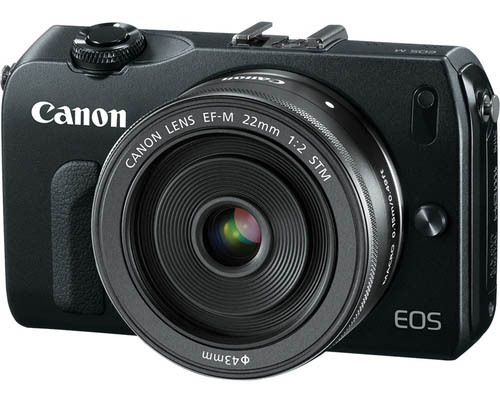 The only EOS-1 series camera in recent years with that. Fortunately, it is similar to the EOS-7D's AF points. When the 7D first came out, I had a tough time adjusting to its black AF points but now I have acclimated myself to its peculiarity and so the 1D X AF points are 'bearable'. Friends of mine have differing opinions on these annoyances but changes to the top of the line camera should be gain acceptance quickly and these two features are not very well received. 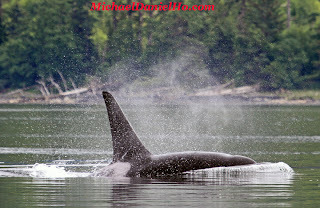 I have now received my EOS-1D X camera and have put it through a rigorous, real world photo shoot in Alaska and Canada. Click here to read my review of the camera and visit my website MichaelDanielHo.com to see many exciting wildlife shots taken with the new gear. 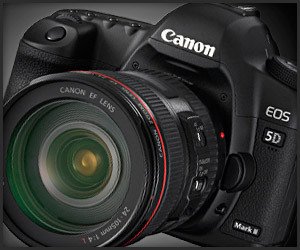 Canon USA has just put the highly acclaimed EOS-5D MK III camera on the list of its Canon Professional Services (CPS) program. It is now available for evaluation on a first come, first served basis, to Gold and Platinum level members. Although I have used the Canon 5D MK III before and have concluded it is the best value in a full framed, DSLR camera in my opinion, I will take advantage of the loan program and borrow the camera for a longer term evaluation before I decide whether to buy it or not. I already own the EOS-1Ds MK III and the EOS-1D V camera bodies so I am in no hurry to buy another full framed camera. Besides, I am getting my Canon EOS-1D X in a very short time and will be evaluating that camera first on my photo shoot to Alaska and Canada. Subscribe to this Blog and keep up with the latest Photography news and get the test results when I post them. Visit my website MichaelDanielHo.com to see Wildlife and Travel photos from my photo shoots and follow my travels on Facebook. With the imminent announcement of the Canon Mirrorless Camera on July 23, 2012, more leaks are available now. 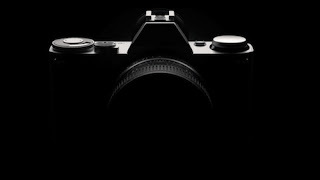 The sensor will most probably be the APS-C, based on the recently released Rebel T4i/650D camera's 18 MP sensor. It may have a different camera mount (strange, if it turned out to be true) but will come with an adapter for the extensive line of EF lenses. It will feature an articulating, touchscreen, similar to the Canon EOS-60D. More post when additional information is available. Egami, the Photography Blog in Japan has discovered more patents filed by Canon Inc. This time it is for the 600mm f/5.6 and 800mm f/5.6 DO lenses. It comprise of 17 elements in 10 groups. 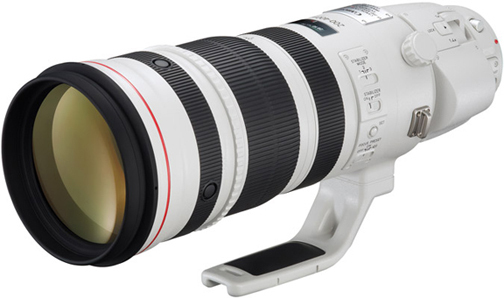 Although Canon has recently introduced the Series II 'white lenses', the current 600mm f/4 and 800mm f/5.6 are quite large lenses weighing in at 8.65 and 9.86 pounds respectively. Canon Japan files many patents, that does not mean they will turn them into production models but it will be very welcomed, especially by me, to have a EF 600mm f/5.6 DO lens in my equipment bag. Diffractive Optics (DO) makes the lens shorter and weigh less, as evidenced by the Canon EF 400mm f/4 DO lens. This is one of my favorite lenses and weighs just a little over 4 pounds. Visit my website MichaelDanielHo.com to see the lens and photos taken with the EF 400mm f/4 DO lens. Great News! 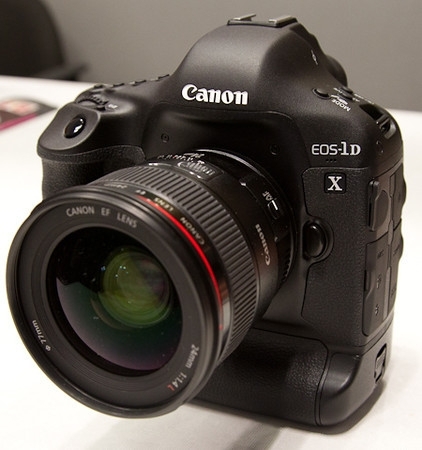 Canon USA has finally released a new Firmware 1.1.1 update to the EOS-1D X to address the 'flaws' photographers like myself have been clamoring for. Read my review of this excellent camera and the official Canon download is available here. 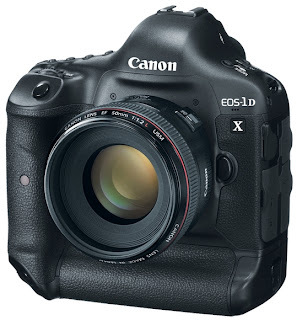 The Canon EOS-1D X camera is slowly trickling into stores. This is the most sophisticated camera body Canon has released to date and they have offered some instructional videos to explain how to take advantage of all its features and functionality. These videos are designed to be viewed at the owner's convenience. They can watch them online, on the go, or even on the camera's LCD screen. Click on the following Canon link to get the tutorial videos. I will be putting the EOS-1D X camera through some real world wildlife photo shoots to compare it with the EOS-1D MK IV, my present favorite Canon body. One thing I know for sure, since the EOS-1D X is a full frame camera and cannot AF with aperture smaller than f/5.6, I will bring both bodies with me. Visit my website MichaelDanielHo.com to see wildlife photos from around the world taken with a long line of EOS-1 series camera bodies. This is a video Canon made available for people who are interested in knowing how their cameras are designed and manufactured. It is a rather long video (about 12.5 minutes) and basically a long advertisement for them but for those who have some time to burn, it may offer some minor entertainment. 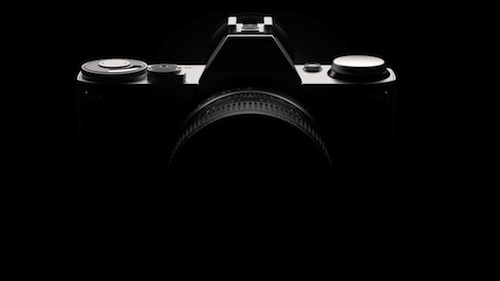 Remember the introduction of the Canon Mirrorless Camera that is scheduled to come on July 28, 2012? It appears Canon will make a major announcement on Monday, July 23 (beginning of the week) instead of the end of the week. This way, there will be more time for the buzz to travel around the Photography Blogs and Camera circles, etc. Most probably it will be for the long due Mirrorless Camera with interchangeable lens and maybe (I can't wait) the official unveiling of the EF 200-400mm f/4L IS + 1.4X extender lens. There may be one or two smaller announcement but the major draw should the be the two items mentioned above. 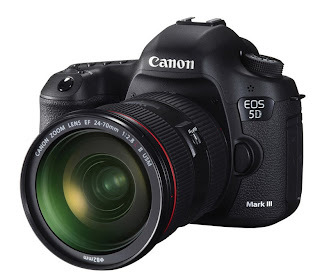 The Canon EOS-5D MK II camera body has been reduced in price by $120, down to $2,079 by a few retailers and one can buy a Canon factory refurbished EOS-5D MK II for $1,760. The refurbished camera body is usually indistinguishable from new ones and comes with a 90 day Canon warranty. I have bought refurbished equipment from Canon before and have been satisfied with the quality of their merchandise. 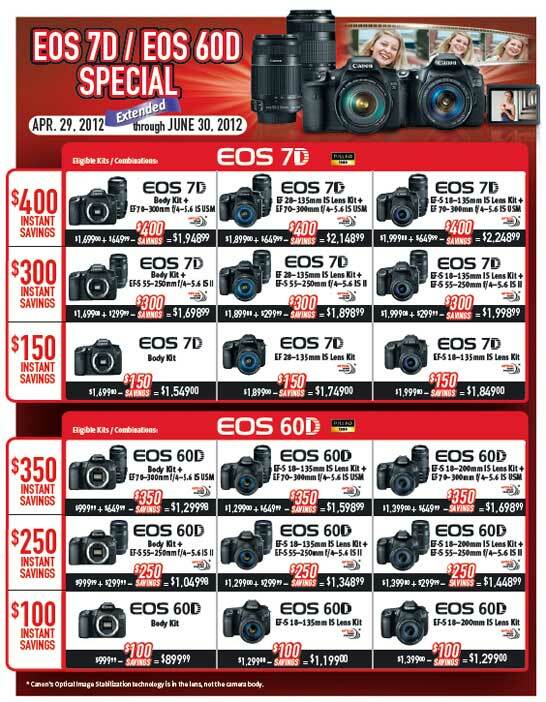 The EOS-5D MK II is still a very good camera and for those who don't need the features and functionality upgrade offered by the EOS-5D MK III, this is a great opportunity to save big money. Visit my website MichaelDanielHo.com to see worldwide Travel photos taken with the EOS-5D bodies. 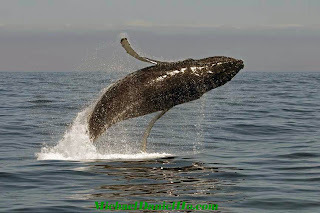 The magnificent Humpback whale is a favorite animal for whale watchers and is renowned for its impressive breaching displays and for the mysterious 'songs' of solitary males. 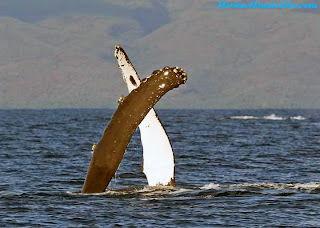 Humpback females are slightly larger than the males. Their robust bodies are blue-black in color, with pale or white undersides. The flippers may also be white and are the largest appendage of any animal; reaching up to fifteen feet in length. On the underside of the mouth are 12 to 36 throat grooves, which can expand when filtering water during feeding. Humpback whales have characteristically knobbly heads, covered in many raised lumps (tubercles) and barnacles. 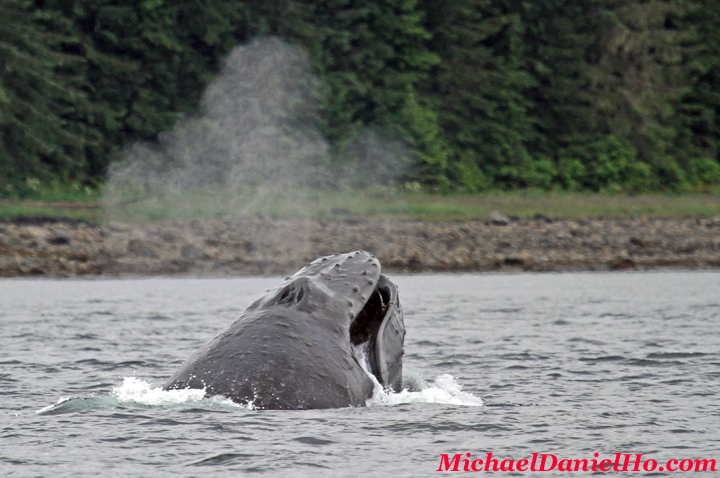 There are two blowholes on the back and the spout of water can appear very bushy. 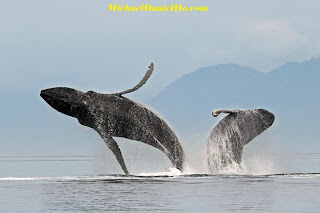 The spreading tail flukes have a distinct indentation in the middle; as the whale undertakes a deep dive it usually arches its back (hence the common name) so that the tail flukes are raised above the water and clearly visible. The pattern on the underside of the flukes is unique and can be used to photo-identify and track individuals. Male humpback whales compete for females directly by escorting receptive mates and aggressively defending them, their famous 'song' is also thought to be a form of courtship. Solitary males sing highly complex songs that are similar within a population but evolve over successive seasons. Calves are born after a 10 to 12 month gestation period, they accompany their mother on the return migration to polar feeding grounds, and studies have shown that individuals return to the same feeding ground consistently year after year. 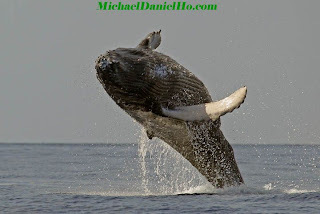 Possibly one of the best-known aspects of humpback whale behavior is their acrobatic aerial display; the most spectacular of which is breaching, when the body of the whale may completely leave the water, returning with an enormous splash. Humpback whales received full protection in 1966 and have since captured the public's imagination. However, a few countries have actually asked for exemptions from the International Whaling Commission to hunt Humpbacks and other great whales for 'scientific' research purposes. These are nothing more than thinly veiled atttempts to restart a small scale commercial whaling operation. 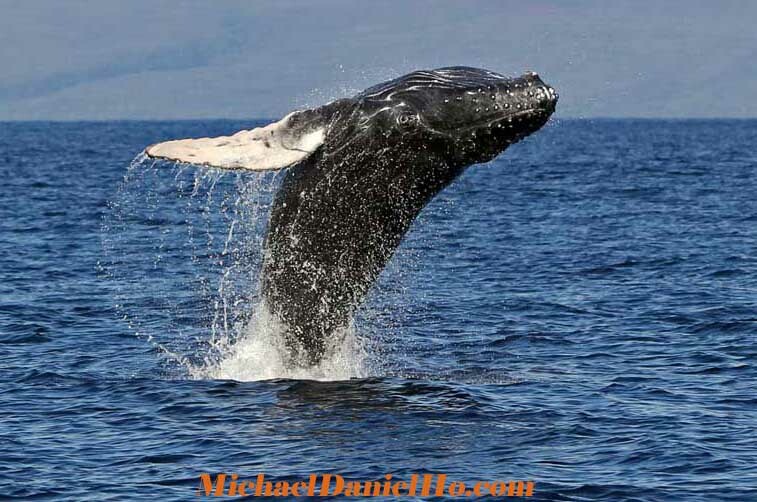 Whale watching tours to see Humpback whales are very popular throughout the world. From countries like Australia, the South Pacific nations and Japan to states like Alaska, Hawaii and both coasts of the United States, people are flocking to join whale watching tours and experience the wonderful world of the Humpbacks. Scientists from around the world, especially on both coasts of the US, Alaska and Hawaii are providing valuable photo identification of individual Humpbacks that has helped to uncover some of the mysteries surrounding their impressive migration. Humpback whales are the most studied of the large whales but little is still known about some aspects of their behavior and about population dynamics, further research and monitoring is therefore needed to safeguard these awe-inspiring acrobats of the sea. Visit my website MichaelDanielHo.com to see many more exciting Humpback and other great whale photos taken around the world. 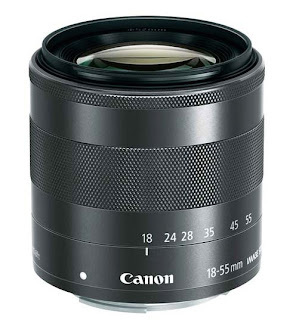 Egami, the Photography Blog in Japan has discovered a patent filed by Canon Japan for the EF 24-70mm f/2.8L II lens with the Image Stabilizer built-in. Although the Nikon AF-S Nikkor 24-70mm f/2.8 lens does not have IS either, some of Canon's other competitors, like the recently released Tamron AF 24-70mm f/2.8 Di VC USD lens does have IS built-in and it has received rather good review. This may be Canon's insurance policy and the recent delay of the shipment of the EF 24-70mm f/2.8L II lens till the middle of September, 2012 due to 'manufacturing operations' may be related to the possible addition of IS some time in the future. I don't care either way. In my opinion, IS is nice but not critical in a lens of this quality and variable focal length. Besides, there is the trade off with additional weight and cost. The new EF 24-70mm f/2.8L II lens already lists for $2,299, not exactly an inexpensive lens to begin with. 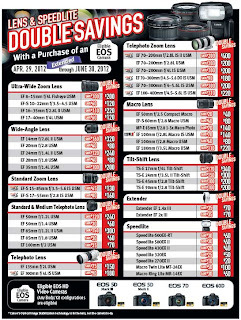 New Canon EF lenses coming in the next few months ? Canon has started shipping the large, 'big white' Series II lenses and the EF 24mm f/2.8 IS and EF 28mm f/2.8 IS lenses are also coming out in larger quantities. They are also finishing up the final production process for the EF 24-70mm f/2.8 II lens and the official announcement of the EF 200-400mm f/4L IS + 1.4X lens is expected soon. 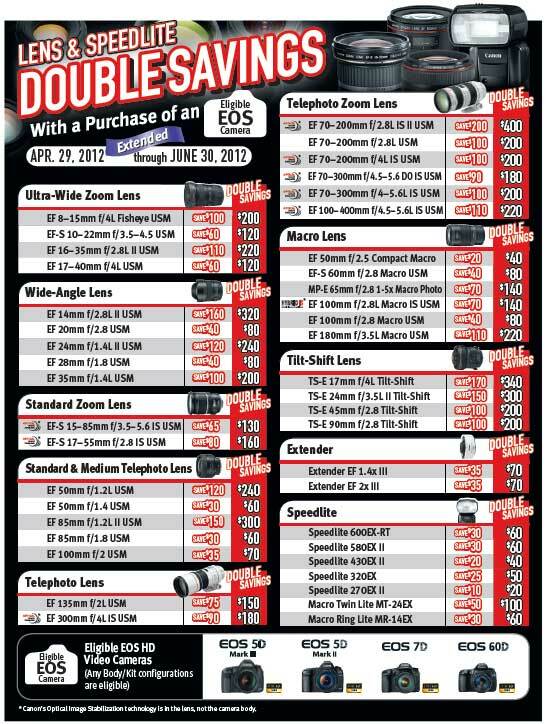 Attention has now been turned to what new lenses are coming in the remaining months of 2012. They have filed many patents for new designs in the past few months, like the EF 135mm f/1.4L II and the EF 14-24mm f/2.8L lenses, etc. The lens I am most interested in is the replacement of the current EF 100-400mm f/4.5-5.6L IS. Although this lens was introduced in 1998 and is showing its age, it is still one of my favorite wildlife lenses. Its combination of weight, sharpness, versatility and price is hard to beat and I expect the replacement lens to be a bit faster on the wider end, perhaps f/4 at 100mm and the push/pull design will be replaced by a focus ring, much like the widely acclaimed EF 70-200mm f/2.8L IS II lens. The price will be quite a bit higher (perhaps around $3,000) but I am willing to pay for performance, just like the 200-400mm f/4 will probably lists for about $11,000. Another lens on my wish list is the replacement to the EF 400mm f/4 DO IS. This is also one of my favorite lenses in Canon's EF lineup. It was first introduced in 2001 and was slow to gain acceptance because of the then new Diffractive Optics (DO) technology. The lens in not one of Canon's sharpest, per se, but the combination of weight and performance more than offset its perceived 'disadvantage' and absolute image sharpness is not the top priority for me when it comes to Wildlife Photography. Although Canon has filed more patents under the DO umbrella, I doubt they will introduce another new DO lens or come out with a EF 400mm f/4 DO IS replacement any time soon. Visit my website MichaelDanielHo.com to see plenty of Wildlife and Travel photos taken around the world with the EF 100-400mm and the EF 400mm DO lenses. The wild Tiger is an iconic symbol of conservation. Nine different subspecies of this carnivore are recognized, three of which became extinct in the latter part of the 20th century : the Bali , Javan and Caspian Tigers. The remaining subspecies are the Siberian, South China, Sumatran, Indochinese, Malayan and Bengal Tigers. Their characteristic dark, vertical stripes patterning the body vary in their width, spacing, and length, and whether they are single or double stripes. The pattern and distribution of the stripes is unique to each Tiger. Poaching and habitat loss have occurred throughout much of the wild Tiger's range and is now severely threatening its survival; as land becomes rapidly developed to meet the increasing demands of the Asian population, tiger populations become isolated in remaining fragments of wilderness and will ultimately die out. In 1973, the Indian government embarked on a Tiger conservation project. They established Project Tiger with the aim of conserving and increasing the country’s Tiger population. India has one of the best National Park systems anywhere and there are currently 21 Tiger reserves, although these are increasingly threatened by human pressures on the parks and its surrounding land. The key to the survival of the Tiger is the maintenance of large tracts of adjacent habitat, but protection of this species is complicated by its man-eater reputation and by the threat it poses to livestock. Increasing, there are human / tiger contact becasue villagers are entering Tiger habitat to collect firewood and do work for the National Parks. The involvement and commitment of local people will be vital for the future sustainability of the magnificent Tigers. In 2010, a collective effort between 13 Tiger range countries made an unprecedented pledge to try and increase and double their Tiger population by the year 2022. To achieve this goal, each of the countries in which the Tiger remains will carry out actions to effectively preserve, manage, enhance and protect Tiger habitats, and to eradicate poaching, smuggling and illegal trade of Tigers. They also pledged to cooperate in transboundary landscape management and in stopping the illegal trade. The range countries also pledged to engage with indigenous and local communities to work towards the restoration of the Tiger to its former range. Only time will tell if this noble effort will bear fruit but the Tiger's survival in the wild in next few decades are not assured and the imminent threat of their extinction is too sad and horrible to comprehend. Visit my website MichaelDanielHo.com to see many photos of the splendid Tiger in its magnificent glory. 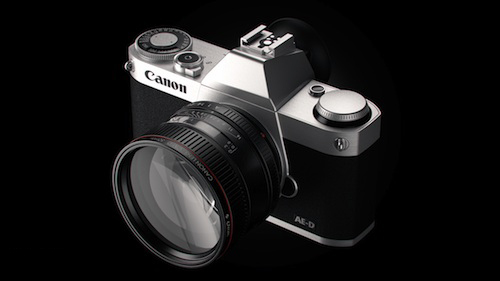 Canon USA has issued a product Advisory for the newly released EOS Rebel T4i camera. The front rubber grips of some units of the EOS Rebel T4i DSLR camera (EOS 650D/EOS Kiss X6i overseas models) may change color (turn white) after a short period of time. Customer support for this phenomenon is described below. Some EOS Rebel T4i digital SLR cameras produced from May 31 through June 15 may be affected. You can use the serial number to check whether your camera is affected by this phenomenon. If the sixth digit of the serial number is “1? please follow the procedure below. If the sixth digit of the serial number is “2? or higher, your camera is not affected. 1) Click on the link below to enter your serial number. 3) One of the following messages will appear. The amount of zinc bis (N,N’-dimethyldithiocarbamate) detected during our testing was minimal. While Canon has not received any reports of injury or allergic reactions, depending on one’s health and physical condition, in rare cases when this substance comes into contact with skin, allergic skin reactions* may develop. In addition, if eyes are rubbed after contact with the substance, symptoms, such as red eyes, may develop. *Please note that the occurrence of allergic skin reactions depend on the target substance, length of contact with the target substance, one’s health and physical conditions, and sensitivity of one’s skin structure, and not everyone will be affected by allergic symptoms. Preparations are underway to provide free repair service for affected cameras by replacement of the rubber grips. Once this repair service is available (ETA of mid July 2012), we will post an update on our web site and also notify registered users via email. 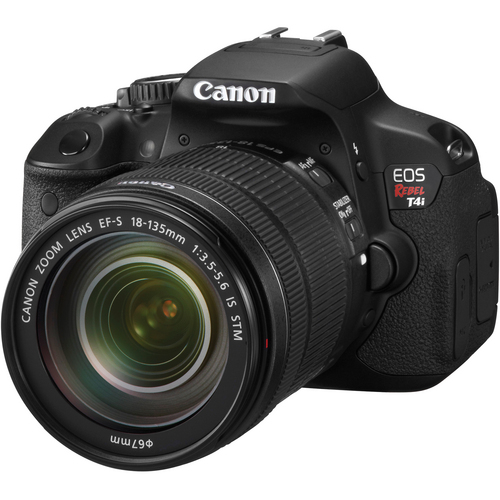 Please register your EOS Rebel T4i, so that we can inform you via email when the free repair service will commence. Customer Support Operations, Canon USA. It is rather disappointing to see another Canon Product Advisory coming out so soon but I suppose it is better to face up to manufacturing defects, however small or annoying, than to ignore it and let the problem fester. 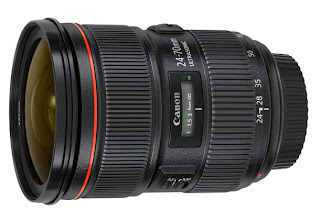 Canon USA announced the EF 24-70mm f/2.8L II lens is now available for sale around mid September, 2012, due to a delay in the production process. This will be a huge disappointment to a lot of people, especially portrait and wedding photographers because this lens is a favorite piece of equipment to many. My camera store has informed me the Canon EOS-1D X is on the loading docks. But because of the July 4 holiday, these are some delay in the shipping and receiving department. They will get the camera out to me before the weekend. I am a bit like an expectant father, pacing the living room floor, waiting anxiously. Going on a big photo shoot in Alaska and Canada in about 2 weeks. Will put the EOS-1D X through some rigorous, real world situations and see how it compares to my present EOS-1D MK IV camera. I have received my EOS-1D X camera now and have put it through a real world, photo shoot in Alaska and Canada. Click here to read my review of the camera and visit my website MichaelDanielHo.com to see photos taken with the new gear. The Canon 200-400mm f/4L IS + 1.4X lens has been spotted in the 2012 Wimbledon Tennis Tournament in London, England recently. The lens will almost be spotted again many times during the 2012 Summer Olympics in London. I have a friend who is a professional Sports Photographer and he is shooting at the Olympic Games. He will let me know how many times the 200-400mm lens made an appearance. 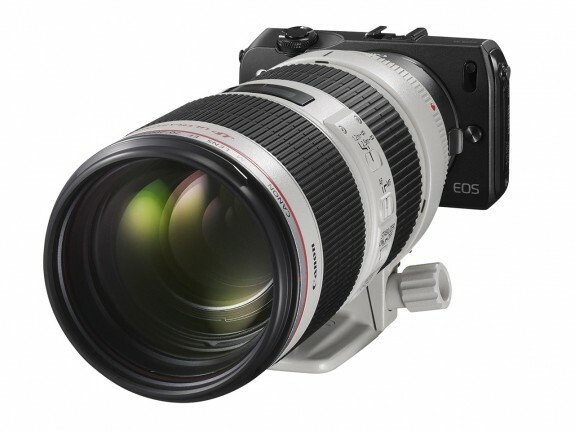 Ever since Canon announced it was developing a new 200-400mm f/4 L IS lens with the built-in 1.4X extender in February 2011, a lot of excitement has been generated and photo enthusiasts from around the world, including myself, have been eagerly anticipating the official announcement. This new lens is of particular interest to me, much more so than the other Series II lenses because of my shooting style. I photograph wildlife a lot and prefer to handhold my camera and lens for maximum mobility and flexibility. Currently, my favorite Canon lens is the 400mm f/4 DO IS. It allows me to follow the wildlife action wherever they go without a tripod. Generally I am wary of using extenders because of the hassle and a slight loss of sharpness. A lens with a built-in extender, like the proposed Canon 200-400mm f/4 L IS may solve that problem. I expect the lens to come in at about 7 pounds. Although the 200-400mm lens will not be a feather weight, I can still handhold the lens and camera combo for a brief period of time to catch my shots. Recently, the 200-400mm f/4 L IS lens has been spotted in Africa going through 'secret' trials. It has been over a year now and admittedly with all the problems and disasters Japan had been experiencing in the last year or so, any delay and complications are to be expected. Now that the Series II lenses - 300mm f/2.8 L IS, 400mm f/2.8 L IS, 500mm f/4 L IS, 600mm f/4 L IS and the EOS-1D X camera are available, albeit in small quantities, Canon can finally turn its full attention to finishing the 200-400mm f/4 project and get ready to announce its official introduction some time before the big Photokina Show in Cologne, Germany in September. The rumored price should be around $11,000 and availability may be late 2012 or early 2013. I can't wait to get a hold of this lens and put it through a real world photo shoot with my Canon 1D-X body. Visit my Equipment Page on my website to see all the equipment discussed in this post and visit my website MichaelDanielHo.com to see Travel and Wildlife images taken with many Canon equipment from all my photo shoots around the world. Click here to read the latest post on the Canon EF 200-400mm f/4L IS 1.4X lens. I have just spoken to my Camera Store and they informed me there is a good chance there will be a shipment of the Canon EOS-1D X cameras coming in some time this week or next week. They cannot guarantee anything but all indications are the ship from Japan has already arrived and the boxes are on their way to various distributors as you read this post. Can't wait because I have a big Alaskan photo shoot coming up in a little over two weeks and I plan to put the EOS-1D X through some real world tests and see how it performs against the EOS-1D MK IV and the EOS-7D cameras. Visit my website MichaelDanielHo.com to see Travel and Wildlife photos taken with both of those cameras and bookmark my Blog to stay up with the latest news and development.